Worship is the center of our life together. In our gathering, we listen for God’s prophetic and gracious word. We strive to make use of a wide range of artistic and musical gifts in all of our worship services at Holy Trinity. We are committed to the inclusion of all people, with no exception, in our worship life together at Holy Trinity. Therefore we practice open communion, welcoming all to the table to receive the sacrament of Holy Communion. Nursery service is available from 8:40 a.m. to 12:10 p.m. every Sunday for infants through age 5. Parents are invited to use this service while in attendance at worship or a class at Holy Trinity. Many parents find that it is a good place for active pre-school children. 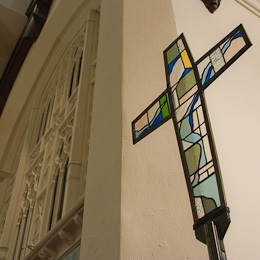 Services of Evening Prayer are also held on Wednesday evenings during the seasons of Advent and Lent and at other times throughout the year.